Perfect for a romantic getaway for two, this completely renovated condo features a collection of limited-edition prints on the walls, and a 40” LED TV in the living/dining room. Just steps away from our complex is the start of Keawakapu Beach, one of the most beautiful sandy beaches in south Maui. Here you can enjoy activities including swimming, boogie boarding and snorkeling. Right next to Kihei Surfside is a famous reef where you might meet our favorite turtle, Sebastian, along with his turtle friends, the elusive eels and bright-colored fish among the beautiful coral reefs. You can walk or jog for a mile on this pristine sandy beach, admiring multi-million-dollar private homes and views of the islands of Molokini and Kaho’olawe. Welcome to Kihei Surfside #405 – what a view! How about this view (and some whale watching in season) to go with your breakfast? New floor-to-ceiling glass windows compliment our newly updated condo! Guests comment on how comfortable this California-king-size bed is! The half bath is convenient when getting ready! Just can’t get enough of the view at the Kihei Surfside 405! Two shared bbqs for the Kihei Surfside guests to enjoy! Chaise lounges available to Kihei Surfside guests – pick your favorite place! Keawakapu beach starts just behind the Surfside – snorkeling and tide pools! With the exception of Christmas we have a 4 night minimum stay requirement. 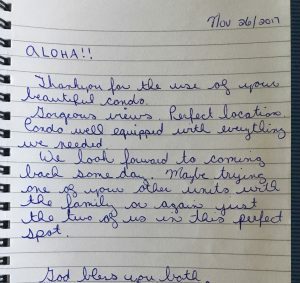 Guest Reviews for our Kihei Surfside condo! It is a very nice and well appointed condo with attention to detail. We especially enjoyed the beach which you can’t see from the terrace but it is actually a very close walk. It is also convenient to high end restaurants and other amenities. Sunset was our favorite time with others at the condos blowing conch shells to welcome every sunset. We hated to leave. First: My wife and I have stayed at the Kihei Surfside 15-20 times over the past 12 years. This room was definitely at the top of that list if not the best room we’ve stayed in at the Surfside. Most of the condos at the Surfside are great, but the things that stood out to us about this one were the kitchen (dishes, utensils, cookware), the closet full of beach stuff (pool noodles, chairs, coolers), and the general quality and feel of the condo. The bedroom was great and the bed itself was large and comfortable. All in all a great condo and the owner was easy to work with and responsive. This was a great place to stay. Walking distance to amazing beaches. Clean and well appointed. We will definitely come back. This condo is immaculate! Beautiful condo with everything you need for a great relaxing vacation. Our 2nd visit to Maui and 1st time at Surfside. No A/C, but you do not need it!! 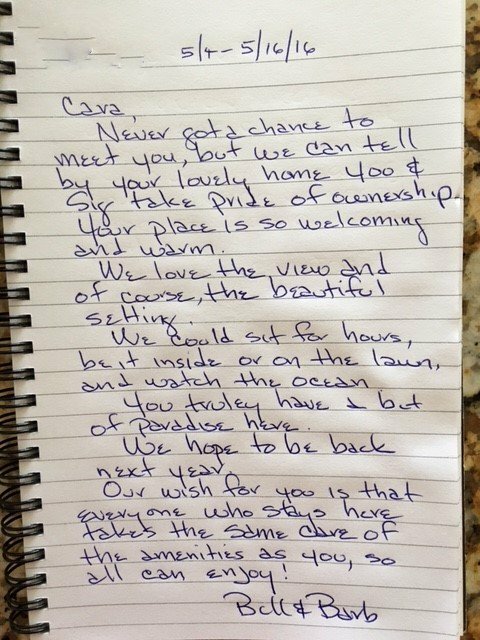 (note from Cara: we do offer a lower ‘summer’ rate from July – September when it can be warm at the condo. It is really a matter of preference). The breeze that comes through will blow you away. We slept well every night in the very comfy king bed. It was the perfect location for us. Close to our favorite beach (Palauea) and our favorite lunch spot (808 Deli). We loved the fact that great snorkeling is right in front and to the left at the beach. The outdoor bar next door at 5 Palms is a few steps away as well. One of the only oceanside bars in Kihei. We did enjoy a “few” drinks there! The grounds at Surfside are perfectly manicured and there’s a great walking path along the ocean to various beaches including a small sea turtle area. We can’t say enough about how perfect this spot is or how clean and comfortable the unit is. Can’t wait to come back! Waking up to this view and the sound of the ocean each morning is special. Everything you need is here. Going to the beach, your covered. Want to cook in, your covered. Never did turn on the TV, but it looks like your covered. No A/C. We had highs 78-84, lows 68-72 and it was fine. Need a breeze, just open the sliding and entry doors. The beach, snorkeling, shopping, dining are all outside the door or a short drive. It’s easy to move around the island with HWY 31 three blocks away. We would stay here again. Could not say enough about our over all experience with this rental and so glad we chose this one! Cara the owner was very responsive and great to deal with. The unit itself is amazing, Very clean, very comfortable and the view is breathtaking! We found this place to be very convenient to restaurants, snorkel spots, Tons of beaches and all the Boating tours/activities are in walking distance to the ramp. We are 100% sure if we go back to Maui, this is where we’ll stay again. We wouldn’t have wanted anything more in Maui. Clean and gorgeous, beautiful property, ocean, waves and turtles all day long. Spectacular view with the sound of the ocean to put yourself to sleep. Kihei Surfside centrally located on the Island for easy access to all amenities. The property it self is well groomed, the greens look like a high end golf course. I would make my stay again at Kihei Surfside with the wonderful owners Cara and Sig. Relax…….. This is a great place to stay. One could almost never leave because of the awesome view and peacefulness of the room. The kitchen is well stocked. When one does leave the room – there is no need to get in the car because there are miles of beach to walk with places to eat within walking distance. Who knew we would find such a lovely accommodation to spend our holidays. This place is perect! Thank you, aloha, mahalo. We have just returned from another wonderful stay at Kihei Surfside 405. It is the perfect vacation spot. The ocean view from the living room, dining room and kitchen can’t be beat. You feel like you are surrounded by beautiful blue water. It is so relaxing and peaceful. Cara, the owner, is very accommodating and easy to work with. It is obvious that they take great care of their condo. Everything is top of the line. We hated to leave! We would highly recommend Kihei Surfside 405 for a vacation in Maui. Cara and Sig’s condo is fabulous for views, comforts (every practical amenity has been thought of and included), and convenience. We walked to the dock for our snorkeling reservations (via Snorkeling Bob’s) on the SeaFire which took us to the crater and Turtle Town. We enjoyed eating in and eating out. The kitchen is fully equipped and the complex has BBQs for use. Cara is a delight to work with and readily available for any questions or needs. We will send all future Maui travelers her way. Mahalo! My husband has never stayed in Kihei, only Wailea and Honolulu, but swears he’d never stay anywhere else but here now! The cleanliness, recent upgrades, and prime location simply cannot be beat 🙂 Keawakapu very quickly became our favourite beach! I couldn’t be more happy with my experience here at Kihei Surfside. We arrived at night and I was so excited to wake up the next morning to the beautiful view. Seriously – you are right on the ocean. This property is perfectly located on the south end of Kihei, almost in Wailea. We were there in August and although Cara told us that the unit lacked air conditioning, we didn’t find it overwhelmingly hot at all. The unit has brand new sliding glass doors that have screens on them, allowing you to hear the ocean and feel a breeze, which we took advantage of often. The suite also has one and a half bathrooms, making it perfect for two people getting ready. This place is so well taken care of and Cara and Sig really set you up for success. The location is perfect for going to other beaches (Big Beach is only a few minutes away by driving), restaurants, and getting groceries, and the drive to Lahaina isn’t bad either – about 45 minutes. The lawn is where we spent most of our time sunbathing and relaxing while on the property. The neighbouring building has a massive beach with lots of opportunities to rent equipment for paddle boarding and snorkelling, which we did, but we having somewhere to lay where we wouldn’t get sandy. There are tons of fish to see while snorkelling right in front of the property, as well as turtles!! The one thing we noted is that it was quite windy the whole time, so you could only really go in the ocean before 11 AM. We were thankful for the wind, however, because in the scorching heat it was nice to have a way to cool off. Ultimately, I would recommend this place to anyone and will definitely consider visiting again next time I am in Maui! We cannot say enough wonderful things about this condo. The oceanside view is spectacular and there is absolutely everything you could ever need to find inside the condo to make your stay as if it were at your own home. 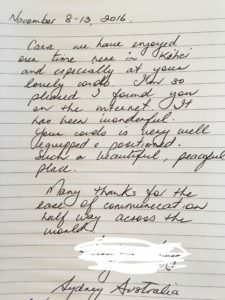 After comparing to other condos in the area that our friends were staying at, we had an increased appreciation for the attention to detail that Cara provides both in the condo as well as the communication leading up to our stay. Seriously, would stay here again in a heartbeat if we ever end up back to Maui. We recently stayed in this unit for 4 nights and absolutely loved it! It was clean and updated, the views from the lanai were spectacular and the grounds were very well kept. The pictures were all very accurate and we were very pleased. All the appliances were very nice and working great and the bed was by far the most comfortable we had stayed in on the island during our 16 day vacation. The only thing that would help is having AC and a washer/dryer in the unit (especially since we had that in the other place we stayed at previously so got used to it) but we already knew this going into it so we were prepared for both things. It was just a particularly humid time of the year but the fans they had helped tremendously. Also, the beach nearby was amazing (very beautiful and a nice swimming beach) and this condo is in a great location for getting to either Kihei or Wailea restaurants and shops. The condo had very nice beach chairs to use as well. We would definitely stay here again and loved every minute of it!! I highly recommend the Kihei Surfside Condos. 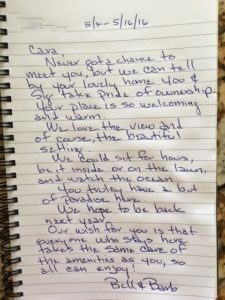 Thank you Cara for opening up your beautiful place to us. Mahalo!! WOW! That is exactly what we said when we walked in the door! The view of the ocean, the immaculate lawn, the clean pool – just WOW! The condo was super clean and comfortable, we did not want to leave Maui! The kitchen was well stocked, the appliances worked, the shower was nice, beach chairs and cooler available, games, fans, nicely decorated, well situated, everything combined to make our stay in Maui one we will never forget! Thank you Cara and Sig! As mentioned in every other review, the condo is very clean, modern, extremely well set up for stays of 7 days or longer. The kitchen was stocked with everything we needed to prepare meals the whole week we were there. The BBQ area outside is very nice as well. The views from the lanai are the best, whales and Maui sunsets!! The pool is clean, with lots of chairs for lounging. We never had to play the resort ‘towel game’ here as there was plenty of loungers to go around. Every other guest we met around the condo was very friendly, and from all over the world. There is plenty of parking, except it tends to fill up around dinner time at the 5Palms at the hotel next door (people parking where they shouldn’t be). Cara, the owner, was an absolute pleasure to deal with. 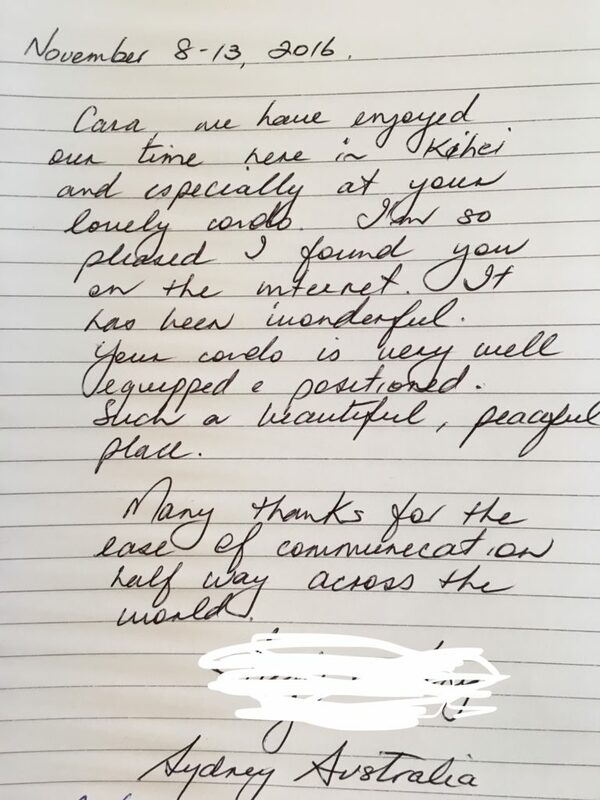 She treated us very well when we arrived, and right from booking (10 months or so before we arrived) she was always a quick email away an very quick to respond. She made the whole payment process very easy and everything was very smooth. I cannot say enough good things about this property. If you are looking for a place to stay for an amazing week in Maui, book the 405 Surfside for 10 days! a week is not enough. The condo is clean, well kept, nicely decorated. Kitchen has everything you need. We enjoyed the great view of the ocean and all the activity from the dining area and saw the big turtle several times. The bed is very comfortable. Great snorkeling and swimming only steps away. The big lush green lawn has many lounges for sunbathing or reading in the shade under the palms. The pool has warm water and is kept very clean. We would like to come again for another relaxing vacation in these beautiful surroundings. Our too-brief stay was exactly what we were looking for to wind down and relax after eight hectic/fun days with a big family group in Kaanapali. Everything is just as represented in the listing: the recently updated condo is clean, comfortable, tastefully decorated, and stocked with all sorts of nice amenities for arriving guests. And the spectacular VIEW! We were sorry to leave and would love to stay there again upon a return to Maui. Wow!! Is the only word that I can use to describe how great your condo is. We couldn’t believe that it could get any better than last year but it did. The new windows make you feel like you are surrounded by nothing but sky, lawn and ocean – beautiful!! 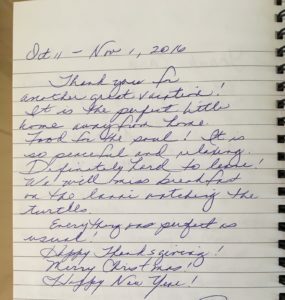 Thank you for another fabulous stay. We spent most of our time just kicking back and relaxing. Food for the soul! We’ll be back next year – can’t wait! Another great Maui stay. We love the location and the comfort/well kept condo. The owners are excellent to work with, and they take great care of the condo. The surf was up, and we watched surfers, whales, and one lone turtle from our window. We like the fact that the condos are not overly populated with visitors from other resorts yet we have access to all the amenities nearby. This condo is perfect! It’s like home away from home. 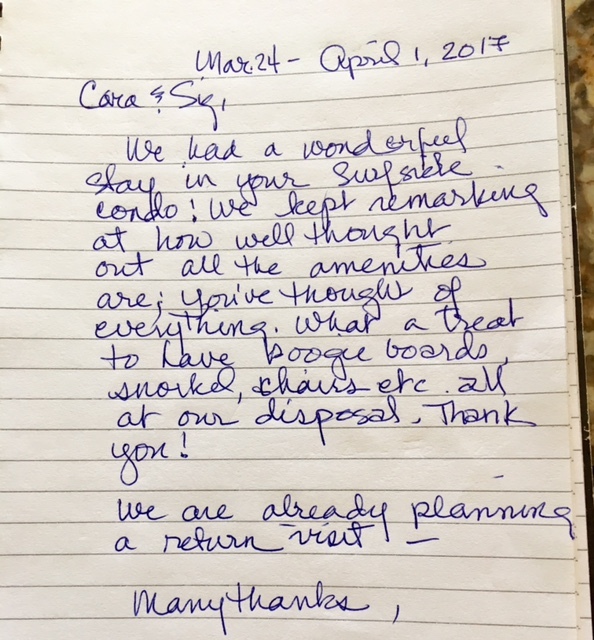 Cara, the owner, went out of her way to make sure that we had everything that we needed. The location is great and the ocean view is magnificent! You can walk to the beach which is right next door to the condo. Beach chairs and coolers were provided. The furnishings are not your typical vacation condo rental, everything was very well done. The kitchen was well stocked with pots, pans, dishes, spices etc. We have stayed at several different places on Maui but this is our new go to condo on Maui. We have already scheduled our stay for next year! We had a great, albeit short, stay at Kihei Surfside. We rented this unit to fill in 3 nights before we moved to a condo on another part of the island. The two full days we were here were great. The condo was clean and the location is absolutely beautiful. However, due to hurricane Anna approaching the area, the humidity was extremely high. Air conditioning would have been nice under this situation but normally would not be needed. Cara was extremely nice and offered to let us stay another night if needed so we wouldn’t have to travel on the day the hurricane was supposed to hit. Fortunately Anna missed the island and our travel plans were not affected. I highly recommend this property. Lovely condo. It was very clean and had everything necessary for a comfortable stay. The owner’s decorations and furnishings were tasteful which we appreciated. 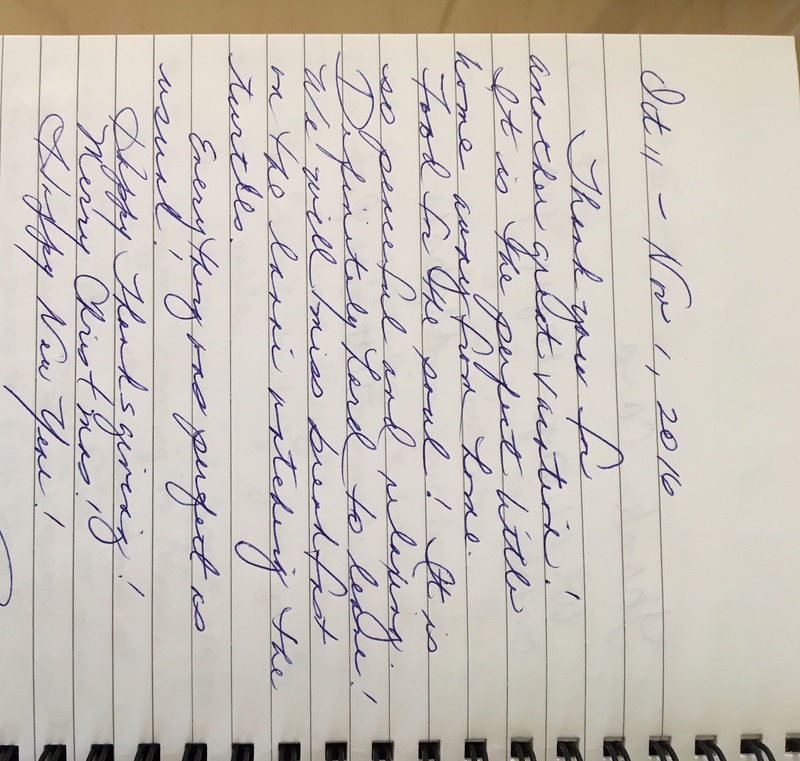 The view from the lanai is gorgeous and the grounds are well maintained A notebook of essential information, local restaurants and other helpful hints is provided. All of the attention to detail is what we really appreciated. Look forward to our next stay. Just got back from a weekend getaway at this lovely condo. This resort is our favorite semi-staycation spot (we live on the Big Island). Hubby & I have stayed in close to a dozen units there and this unit may well be our favorite yet! The brand new kitchen and bathrooms are GORGEOUS! We are good in the kitchen and usually cook when we stay at Surfside, but this time we decided ahead of time to “live it up” and go out to eat both nights. After seeing how beautiful and extremely well equipped the kitchen was, I must admit I regretted that decision a bit. (My husband held me to it tho!) The big screen hi-def TV was appreciated during our down time. There was a nice selection of games that we surely would have busted out had we been there longer. The bedroom was very nicely furnished, and the bed was one of the most comfortable I have EVER slept on. Plus being on the ocean end of the building is always nice! And of course all the great amenities of the property… You really can’t go wrong with this condo! If you are considering a stay in this unit, JUST DO IT! You will be glad you did. If you’re looking for the perfect oceanfront vacation in Maui, and your requirements are – great ocean views, nice/updated clean space, access to pool and other resort like amenities, but don’t want to pay $$$$ the Maui resort rate – just stop right here. I challenge anyone to find a better value than what we found here. It is one of the most beautiful properties in South Maui. 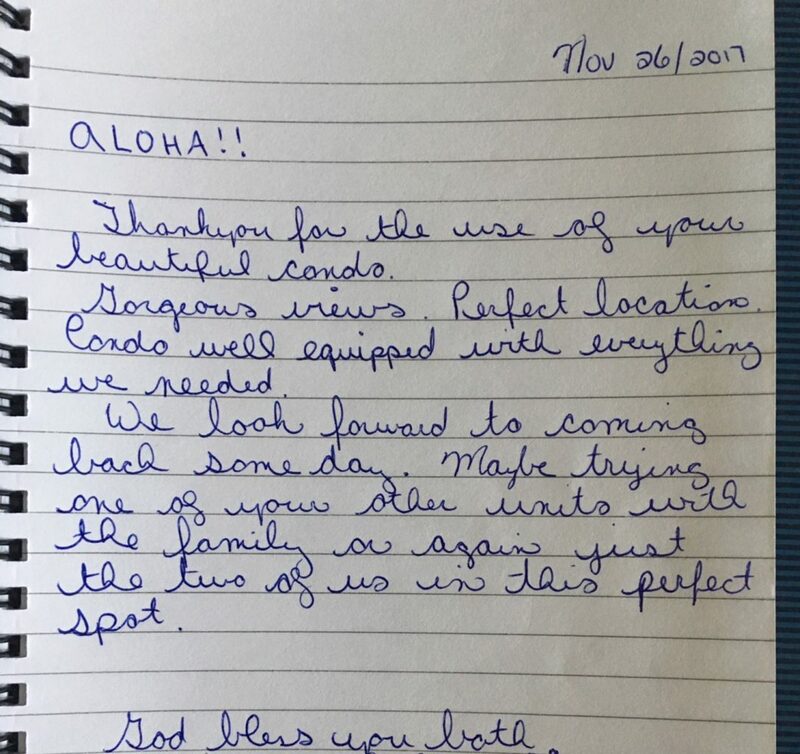 We met many other friendly people staying at the condo building and some have said that have been coming with their families for over 20 years. It’s that kind of place. The views are incredible. Just about every evening you will see a sunset that is one of the best sunsets you’ve ever seen. The Kitchen is well equipped – we loved being able to cook breakfast and sit on the lanai. The rooms were clean and the bathrooms have been updated. There is no AC, and a couple days got into the high 80s, however we were fine. The cross breeze through the unit w/ the fans is more than enough to cool you off. Cara is a very helpful owner. Everything was prepared for us so we never had to contact her during our stay. My wife and I were a combination of adventure seekers/beach bums during our 7 days here – and it was the perfect home base for that. If we ever make it back to Maui, there is no reason why we would stay anywhere except here. Unit is exactly as described and more. Owners have gone above and beyond and have supplied everything you could possibly think of, and then some! Unit was clean and location is perfect and beautiful. The grounds are pristine! Views are beautiful. Cara was a great help in recommending several area restaurants. Hope to be back soon!